How long have you been on SAR and on the short-haul team? 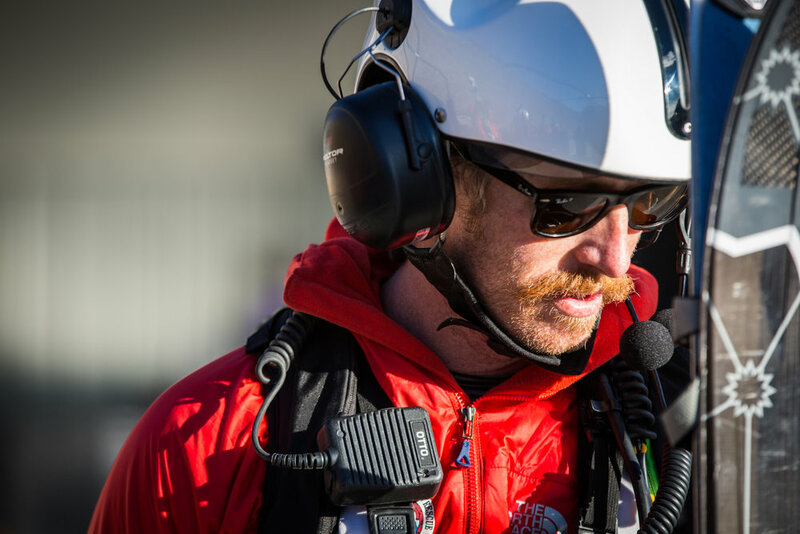 Cody: I’ve been on SAR for 9 years and the short-haul team for about 5. What motivated you to apply to be on the short-haul team? Cody: At the time it seemed a little bit like the glamour job - you know you get to fly around on the helicopter and it seems action packed and cool. At face value it was probably that simple. What do you like most about being on the short-haul team or flying? Cody: You get a perspective of the valley that you can’t get any other way. For example yesterday we were short-hauling over Teewinot and you see the intricacies of the valley which I really enjoy. And the most rewarding part is you’re there for someone when they need you. There’s a handful of times that it’s extremely rewarding. Cody: At times it’s scary. You’re hanging it out there - exposure, the elements, the cold, where you’re at in the mountains - it’s scary. Most of the time during rescues you’re able to put it all aside and focus but if you let your mind wander and look at all of the variables the scary factors can start to add up. What is the scariest experience you’ve had? Cody: Probably some of the scarier times have actually been in the helicopter rather than short-hauling - bad conditions, trying to land in a spot that’s not intended for a helicopter. And it’s a rescue and someone is calling for our help so the team and the pilot have a strong desire to get there and that forces you to fly right at the edge of what the helicopter can do and sometimes you don’t know what side of that edge you’re on. There have been some helicopter landings and some snowy, windy mountain top environments where all you’re thinking is ‘land this thing as quick as possible so I can jump out and get out of this thing’. Any rituals or superstitions before you fly? Cody: Before a mission when things are about to go live I normally just kind of go silent, take a deep breath, close my eyes and lock it in - everything now matters. You can’t be thinking about the drama in your life or anything else that’s going on - you have to deal with what’s in front of you right now. So yeah, I do have a ritual that helps me do that. What’s you’re favorite role on the helicopter - spotter or short-hauler? Cody: Short-hauling is way cooler. You get to be on the mountain. The most fun part isn’t necessarily flying into the mountains, it’s when you’re on the mountain and get to be an athlete, climb around, dig someone out of the snow, package a patient, put your skis on - that’s when I’m in my element and I just manage what’s going on on the mountain. When you’re in the helicopter you’re at the mercy of the pilot and when you’re spotting - it’s an equally important role - but all of your time is in the helicopter and you never get to put boots on the ground. I’m always looking for an opportunity to put my skis on. And being a spotter is cold. As much as I know the helicopter is an important tool, I’d just as soon spend as little time in it as possible. What has been the most intense or best rescue you’ve been involved with on the helicopter, and you’ve been on a lot of them? Cody: I think the one we did the podcast on (Gothic Couloir/No Name rescue). That was one of the most rewarding ones just because everyone lived. I’ve been on I think as many or more short-hauls where I’ve been dealing with a fatality rather than a life saved so it was a very clear example of short-haul working. There are a lot of times where we short-haul because it was maybe the most comfortable for the patient or the quickest or made the most sense for a lot of reasons, but it isn’t always a very defined life-or-death situation where we knew this person was going to die in the next hour. The No-Name rescue was one where the clock was ticking. And also I had just dealt with 6 avalanche fatalities before that - just bang bang bang… so to go get a live one was emotional and rewarding. You know a lot of the volunteers on the short-haul team put hundreds and hundreds of hours into training - hundreds of days training - before you get a rescue, or at least a successful rescue. A lot goes into making that happen - it doesn’t just happen on it’s own. It’s an incredible amount of time. What is the most important personality trait or skill for a short-haul member to have? Cody: I think the ability to be calm. Things are moving fast and there are a lot of variables out there that are dangerous. You have to have the ability to work through those things in a succinct and organized fashion. Otherwise you can get yourself in a bad position. Our team has two branches - a medical branch (doctors, EMTs) and then we have the technical branch (skiers, mountaineers) that can go in there and solve problems and they’re both equally important. A lot of times in the short-haul environment we’re not trying to provide a lot of medical care, we’re just trying to drag someone off the mountain as quick as we can and get them to the ambulance and care. So you need folks that can move around quickly in challenging terrain. How would you describe your demeanor once you’re out there on a mission? Cody: Depends on the day. I definitely have times where I’m excited and catch myself getting a little too ambitious and so I think I’ve had it all. But the rescues where things have gone the best are when we’ve been able to slow it down and approach it from a very methodical and controlled pace, because it’s very easy to get wound up to screaming and running and almost a panicked atmosphere and then one problem leads to another to another. Have you ever been left behind so a patient could be flown out? Cody: Yep. I have been left. I was actually left this year down in Pinedale and we had to get rescued by another team per se (laughs). There have been others - there was a double avalanche fatality at the Village and we were able to fly one victim out and we had to ski out with the other victim’s body. So there have been a couple of times but it doesn’t happen often - we try to stay with the ship. The times you get left are when the weather is bad and the helicopter gets lucky and gets in there once and they’re not going to do it again. How you ever been sick on the helicopter? Cody: No - never puked. One time I did get a little motion sickness and just had to come back to the hangar and have a la Croix to settle my stomach down.